SARASOTA — Sarasota-based artist John Sims is a conceptual “math artist” – as well as a musician, curator, digital artist and the controversial creator of the annual Confederate flag “Burn and Bury” events around the country. And he’s reaching a milestone year. “This is a big birthday year for me…I need some advice, I got a month to go!” he laughed affably. A digital-age renaissance man, Sims is an imposing figure, standing well over six feet, with a crown of untethered locks, nerdy glasses and a congenial personality. He seems to embody the walking contradictions that challenge easy assumptions about black, male artists and intellectuals in the 21st century. The dichotomy existing in Sims’ early influences fuel his creative projects today. Part of his inspiration is connecting what seem to be opposites, the mixing of oppositional forces. 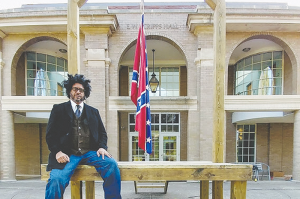 Sims has made waves in both the art world and the political sphere through his 16-year-long creative exploration/opposition to the Confederate flag – beginning with his “Recoloration Proclamation” in 2001. The project began to take shape after Sims moved to Sarasota in 1997 when as a doctoral student in mathematics at Wesleyan University he landed a position at Ringling College developing visual mathematics curricula for its design students. As a transplanted northerner, the presence of the flag in the South was an affront that goaded him to action. “Why must my visual field be subject to images of a lost war? Why must I endure the discomfort I feel when I see a pickup truck with the flag? Or even worse, the numbed out black Southerners who have learned to tune it all out,” he wrote on his website. Today, Sims draws the analogy of complacency around the Confederate flag to domestic abuse and he’s passionate about the danger it represents. For Sims, it was like walking into a place and seeing abusive behavior but everyone else was just a part of it. Sims has traveled the country exhibiting his over 20 “recolorations” and “reconstructed” flags. It’s been a long journey, complete with death threats, protests and media attention. While Sims continues to expand on the work, he sees the bulk of his flag project as accomplished. “I would say that I completed a particular chapter in this ongoing project that will connect to other projects in other collaborations, other protest movements around the country,” he shared. 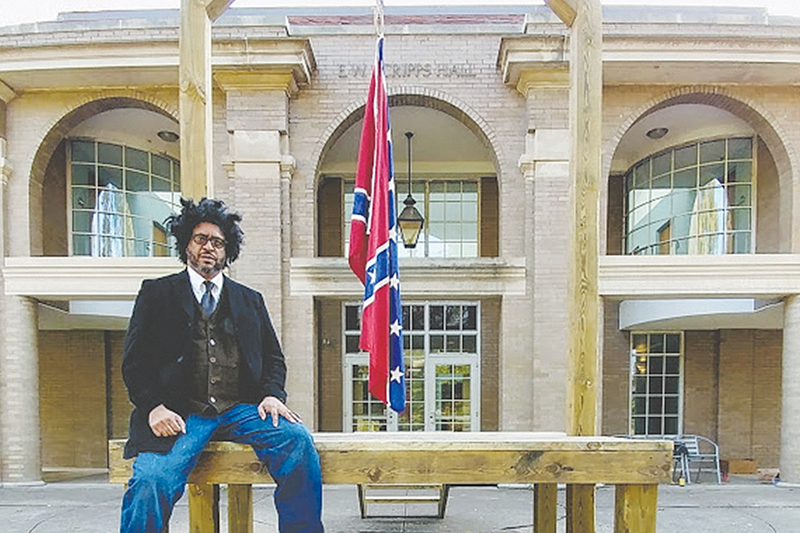 Last October, he and a group of artists, students and educators enacted the performance piece “Confederate Flag: A Public Hanging” at Ohio University, featuring the hanging a Confederate flag from a 13-foot gallows. This later became the exhibit entitled “The Proper Way to Hang a Confederate Flag,” which showed at Ohio’s Kennedy Museum. Sims also recorded a CD called “The AfroDixie Remixes” that brings musicians and poets together to create new versions of Old South musical standards and create conversation around themes of race and history. A recent AfroDixie Listening Party in Martha’s Vineyard included feedback by journalist Charlayne Hunter-Gault and Congresswoman Eleanor Holmes Norton. Sims’ flag protest has created annual “Burn and Bury” events, which began in 2015 when he arranged 13 flag funerals in 13 states with contributions from poets in each location. The other areas include an upcoming Valentine’s Day event that brings Sims to New York City for “The SquareRoot of Love” project. His part used the language of algebra and the idea of the square root of love: what are the factors of love? What times what equals love? It became a kind of metaphysical, metaphorical exploration into the different components of what love might mean. Nearly a decade later, Sims has revisited the event. Starting in the South of France and working with a winery in Bordeaux country, he’s produced his own wine labeled with his signature SquareRoot of Love emblem on the front and his poem of the same name on the back. This month, Sims returns to New York on Feb. 12 and then Paris on the 14th with a lineup of poets and performances for a new round of his Valentine’s Day Project. When asked about bringing his work to St. Pete, Sims enthusiastically begins to list possibilities, indicating he might still have more explorations to do in the region around his flag project after all. For more information on John Sims Projects, visit www.johnsimsprojects.com.